Caulking is the icing on the cake, but its purpose is certainly not only decorative. It's the last step in your shower installation to make sure no water gets through and causes mold. For areas prone to water damage, use 100% silicone caulk. Once the grout has cured, you can finally address those movement joints at the intersections of walls, around fixtures, above the tub surround and at the shower base. We recommend the use of TEC® Skill Set Silicone Caulk, but to ensure matching, it’s best to use a caulk from the same manufacturer and same color as your grout. 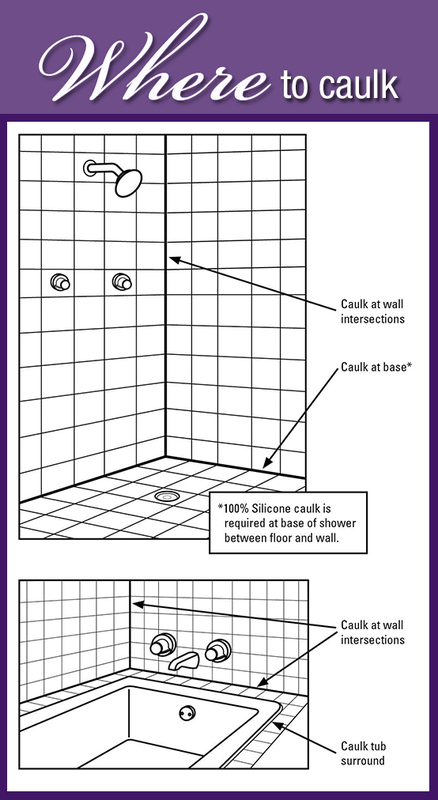 Note that 100% silicone caulk is required at base of shower between floor and wall. Your movement joints must be completely dry before beginning to caulk. Otherwise, the caulking will not stick. 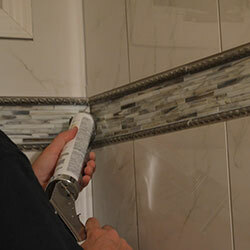 Using a caulking gun, squeeze a thin bead of tub-and-tile caulk, the same color as the grout, into your movement joints. Aim to install enough caulking to completely fill the joint without over-filling and making a mess. When the joint has been filled, smooth it with a wet finger or putty knife. Wipe away excess caulk. TEC® Skill Set Silicone Caulk and caulking guns are available at Lowe's home improvement centers. We are removing moldy caulk in the shower along the floor and wall seam joints. Should we put grout into the seams and then caulk over it, or should we just use caulk? Thank you. Hi Don, You just need to use caulk. Routine cleaning with an alkaline cleaner will help keep any future build-up of soap scum from forming and help eliminate mold growth. Good air circulation in the shower after use also helps prevent mold and mildew from forming. Hope that helps! Just purchased some power grout for our newly tiled shower. Do I grout wall to ceiling, wall to floor and wall to wall joints with grout and THEN apply 100% silicone or do I leave these joints free of grout and seal them after grout process with 100% silicone? Also, any special techniques required with Power Grout that makes it different from regular sanded grout application? Hi John! General rule of thumb: Do not grout tile at the wall to wall joints, around any corner shelves or dishes/fixtures or at the base of the shower floor. Leave those places without grout. Once you've grouted your remaining tile areas, allow the grout to set for awhile. If you can touch the grout with the base of your finger without any grout coming off, then you're ready to go ahead and fill the wall to wall joints/fixtures and base of the shower floor with caulk. As for your question about TEC Power Grout, there isn't a different technique to using this product. It's easy to mix and spread. Contractors love it! And it never needs sealing to maintain stain resistance. Hope that helps. Hi Roger, Happy to answer your question. There's no need to grout the shower corners. Use silicone caulk only around all joints/corners and change of materials (like around soap dishes). Here's a link to a video I created that might be helpful to you! http://bit.ly/1RnK8Rx Good luck! Yes, that's correct Ann. Here's a link to a video that I created on how to tile a shower. bit.ly/1RnK8Rx I start talking about caulk around 6 minutes into the video. Hope you find the video helpful.